CU-Boulder students, working under the guidance of LASP scientists and engineers, have finished building a satellite to study space weather and have sent it to California Polytechnic Institute to begin integration with launch vehicle systems. More than 50 graduate and undergraduate students have contributed to designing and building the Colorado Student Space Weather Experiment (CSSWE), an $840,000 CubeSat mission funded by the National Science Foundation. The satellite is scheduled to launch into low-Earth polar orbit in early August 2012 as a secondary payload under NASA’s Educational Launch of Nanosatellites (ELaNa) program. CSSWE will consist of a single instrument, called the Relativistic Electron and Proton Telescope Integrated Little Experiment (REPTile). REPTile is a scaled down version of the REPT instrument, which is being built at LASP for NASA’s Radiation Belt Storm Probes mission. It is composed of four stacked solid-state silicon detectors that will monitor solar energetic particles as they impact the radiation belts held in place by Earth’s magnetic field in space. CSSWE will be one of eight nanosatellites launching as secondary payloads on a U.S. Department of Defense rocket. Data from the satellite will be used to assist scientists in predicting how solar activity affects human endeavors such as GPS and other satellite operations, radio communications, and air traffic control. In order to transmit data from the satellite to the laboratory, LASP students have also constructed a ground station for the CSSWE project. 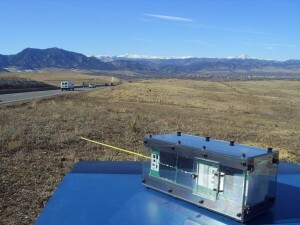 The ground station represents one of the subsystems of the CubeSat project, which is offered as a course through the University of Colorado Boulder Aerospace Engineering Sciences Department. Students meet with mentor professors, including LASP scientist Xinlin Li, two times each semester for reviews on each subsystem. After launch, the CubeSat will release from the main payload in low-Earth orbit and begin aligning with the Earth’s magnetic field lines. LASP mission operators will spend several weeks performing checks on system functions before the mission returns data for analysis and interpretation.